The first free agent acquisition to make the list, Philip Wheeler, joins the Miami Dolphins after four years in Indianapolis and one in Oakland. 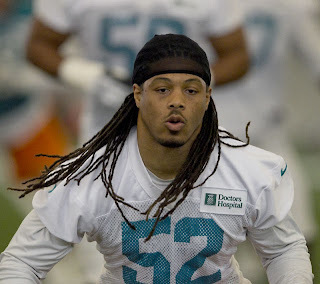 Wheeler will team up with Koa Misi and Dannell Ellerbee, another offseason acquisition, to form the linebacking corps in Miami's 4-3 defense in 2013. With the exception of Jason Trusnik, who has been little used as a linebacker during his career, Wheeler is the most experienced linebacker on the Miami roster and brings more than 100 combined tackles with him from Oakland. Wheeler and Ellerbee will be tasked with replacing Karlos Dansby and Kevin Burnett, who left this offseason. While Dansby and Burnett were solid with the Dolphins and each combined for more than 100 tackles a season ago, they lack the play-making ability that Wheeler can bring. Wheeler, at just 240 pounds, possesses excellent speed for a linebacker and led a porous Oakland defense with 108 tackles a season ago. While Burnett and Dansby combined for just three and a half sacks and one forced fumble a year ago with Miami, Wheeler had three sacks and two forced fumbles with the Raiders last season. Wheeler has also been the epitome of durability. In his five seasons in the NFL, Wheeler has played in all 16 games four times and has missed just three games for his entire career. Wheeler does not have an interception in his five-year career and his contributions in pass defense will need to improve, but Wheeler can move and should be able to have a career-year in Kevin Coyle's defense. Wheeler's experience playing on a contending team could also prove invaluable for a Miami team looking to move to the next level. In his four years with Indianapolis, Wheeler was on three playoff teams and played in Super Bowl XLIV against the New Orleans Saints. While he wasn't the most intricate part of those Colts teams, having the experience at a critical defensive position can only be seen as a positive. While the Miami Dolphins are losing their top two tacklers from a year ago, Wheeler should help fill that void for what could be Miami's weakest position on defense. While Wheeler may not be as consistent a tackler as either Dansby or Burnett, he is a better pass-rusher and had more forced fumbles a year ago than both combined. With a defense that was near the top of the league against the run last season and with a Pro Bowl caliber safety in Reshad Jones at the back end, the linebacker position will be critical for Miami. If Philip Wheeler can have a third straight career-year, the Dolphins should manage to be just fine in a division that, with the exception of New England, lacks offense.